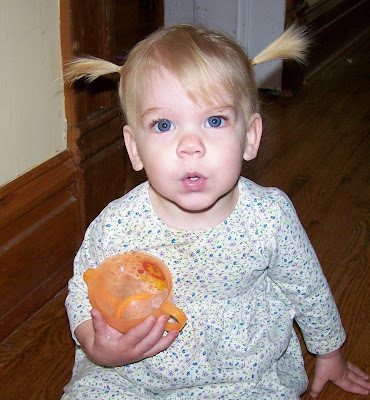 nothing is cuter than a girl's first pigtails. ohhh you are right. adorable!!! Cakes, I have been meaning to tell you how strange it was for me to watch a few of your "Peek-in Monday" videos and "realize" that your kids had "real" names! Honestly, because our friendship originated in cyberspace, I was introduced to each of your kids with these nicknames. And these nicknames have really become who they are in my head. Quite funny actually! I love the sculptures in the gardens too. The pebbles/tiles look so good. It makes me want to reach out and touch them. I have been meaning to say (and everytime I get on the computer to do so, I have children hanging off me, so I have not had the chance), I read all your stories about Skaterboy. What a wonderful job you have done raising him, through tough times/opposition. I'm glad he now has a plan for his schooling. That is very exciting. And great news the new little one is still hanging in there. Oh my KT that is a cute picture. She looks a lot like Jellybean in this photo. SHe is just soo cute, as all your kids are. Freakin' adorable, little "who me?" face and all! She is adorable! I love the expression! *sigh* Hanna won't be ready for her first ponytails for at least a year. Whenever I pull out a camera, I get "CHEESE" and she shoves her little face right into the lens of the camera. What I want to know is how long they lasted! In my house, at that age, the amswer would be out 3 milliseconds, give or take. However I agree, so adorable you just keep on repeating the exercise! Soooo sweet! I LOVE the whoville lips! You have got the cutest kids! sweet! and what beautiful blue eyes. My little one had his first pigtails recently, too, thanks to his big sister!